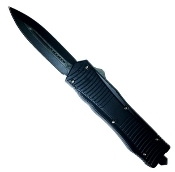 Featuring a heavy duty style, this OTF sports a glass breaker which can punch through any tough windshield. You can feel the solidness in this OTF Knife. It has a black coated metal handle. The black, double edged, spear point blade is Black Anodize 440 stainless steel finish with a nicely designed black blood groove in the center. This knife features an improved internal mechanism for more consistent firing. It's a dual action, so pressing forward on the slide button shoots the blade out, and backward pulls the blade back in. It’s slim and easy to carry with the pocket clip mounted on the back.